Fans first got a sneak peek at Tyler’s Simple video during the TV broadcast premiere March 14-18 on The Country Network, a network available in over 40 million homes nationwide. Tyler launched his new album Good for Me featuring the single Simple on iTunes, Spotify, Google Play & Amazon premiering inside the Top 40 on iTunes Country Album Charts on January 26. The first preview of this Georgia native’s project was launched at the close of 2017 when The Boot premiered the lyric video for the title track Good For Me. Tyler’s 2018 started behind the wheel at the “Superbowl” of racing the Lucas Oil Chili Bowl Nationals where top drivers from NASCAR, USAC midget and sprint cars, NHRA drag racers and IndyCar drivers all competed against each other to capture the legendary championship trophy. Transitioning from the racing arena to the music community, Tyler celebrated his album release week performing on the RFD-TV #MusicMonday series, co-hosting Nashville Today on WSM with Devon O’Day and Lexi Carter, performing on WSMV-NBC’s Today in Nashville and recording segments with numerous radio programs including the industry icons Lorianne Crook and Charlie Chase. His Crook and Chase Countdown Discovery Artist segment premiered February 3 & 4. The lyric video for Simple was exclusively premiered on PopCulture.com on February 16. This Stone Mountain, GA native was reared in a household with parents that spun the hits of Marvin Gaye and Michael W. Smith while Tyler and his older brother were discovering the hitmakers of the 90s — Alan Jackson, George Strait, Boyz II Men & Mariah Carey. Recognizing early on that he wanted a career in entertainment, he would capture a role in Joseph and the Amazing Technicolor Dreamcoat and performed for two years at the Fox Theater in Atlanta at ages 11 and 12. However, a failed performance at age 13 in a rock band caused him to change directions. Tyler would then spend his summers with his uncles in the auto shop learning the mechanics behind combustion engines and began his path to the NASCAR late model and sprint car racing series. After nearly a decade of milestones that would find him capturing his first victory lane among 15 years veterans during his fourth year as a driver and even finishing as the #2 ranking position in points in his series, he decided to finally overcome his fear of the stage and redirected his focus to music. This journey would spawn a debut ep Believe Again and book I Have a Voice, the inspirational and motivational look at the lessons he’s learned in the racing and now music community. Continuing to hone his craft while he furthers his racing career, Tyler’s second project Good For Me premiered on January 26 inside the Top 40 on the iTunes Country Album Charts. Beyond the Sun, the Canadian reared trio of brothers, is excited to share the lyric video for their new single Dance Floor via an exclusive premiere on DigitalJournal.com today. “Their rich vocals on Dance Floor are youthful and refreshing, where the listeners can recall the pop-rock band Fun (fronted by Nate Ruess). The song has a liberating vibe to it, which will resonate well with their fan-base,” wrote the Digital Journal’s Markos Papadatos. To view the lyric video, click here. The trio also performed the single today at “Today in Nashville” on WSMV-NBC in Music City. Hosted by Kelly Sutton and Carole Sullivan, the appearance marked Beyond the Sun’s second appearance on the program since their move to Music City. Click the image below for the segment. 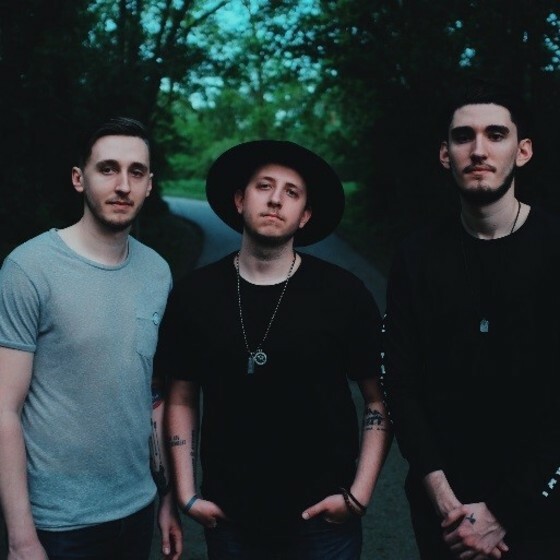 Canadian bred band Beyond the Sun is paving their own path in a genre they coined as “shuffle.” Made up of three tight-knit brothers, the group features (l-r) guitarist Phil, singer Colin and drummer Dalton Radu, who were reared in the small town of Bowmanville, Ontario. It all started with plastic guitars and living room concerts for their parents at the ages of 6, 8 and 11. Little did they know at the time that just over a decade later they would be hearing themselves on Sirius XM radio and headlining a 7,000-person sold-out crowd at Puerto Rico’s Wild Summer Festival. With traces of their influences – which include artists like Coldplay, Billy Currington, Bruce Springsteen and Florida Georgia Line – threaded into each one of their songs, their sound is a progressive mix that is putting them on the heels of acts like Chris Lane and Ryan Follese. Now, the trio has relocated to Nashville, Tenn. where they recently celebrated the release of their new single, Dance Floor as a follow up to the Music Row charts breakthrough Cruisin’ Round Town. YAMATO – The Drummers of Japan return to Wharton Center! NASHVILLE, Tenn. (February 2, 2018) — Best defined as “punk country,” Kalie Shorr proved yet again that she is the queen of content, releasing an electric new music video for her hit single “Two Hands.” Shorr gave a sneak peek to a sold-out crowd of industry and media VIPS, fans and friends during her launch party for her new EP Awake last week at The Back Corner in Nashville. The color filled, psychedelic video premiered on CMT and CMT.com Friday morning and has since been added to GAC and to the top of Vevo’s DSCVR playlist. Vote for “Two Hands” on CMT Hot 20 Countdown Heatseeker Poll here. On a sky-blue February morning, with sunlight just hitting the tops of the trees, a sizeable crowd had gathered in the courtyard at the Howell Conference and Nature Center, located northwest of Detroit in Livingston County. The scene was festive, although a bit odd, with some people dressed in Hawaiian hats, shirts and leis, waiting for Michigan’s official groundhog to waddle out of its house and predict whether there would be six more weeks of winter. Excitement was building among the schoolchildren, parents and others huddling together just a few feet away from the viewing platform. The crowd replied, “Yes,” laughing. Check out this sidebar story on Michigan’s woodchucks. The prognostication, of course, is determined by whether the groundhog sees its shadow, which portends another six weeks of the year’s coldest season. No shadow signifies an early spring. A small, but stylish, single-story, wood-sided house sat on a portable stage, amid rows of blooming blue, yellow and orange plastic flowers, a Christmas tree left over from the holidays and at least one plastic palm tree. This home belongs to Woody the Woodchuck, or groundhog. Woody is a she and was born in the spring of 1998 and brought to the nature center’s Wildlife Clinic in June of that year. “She will be 20 years old this year. 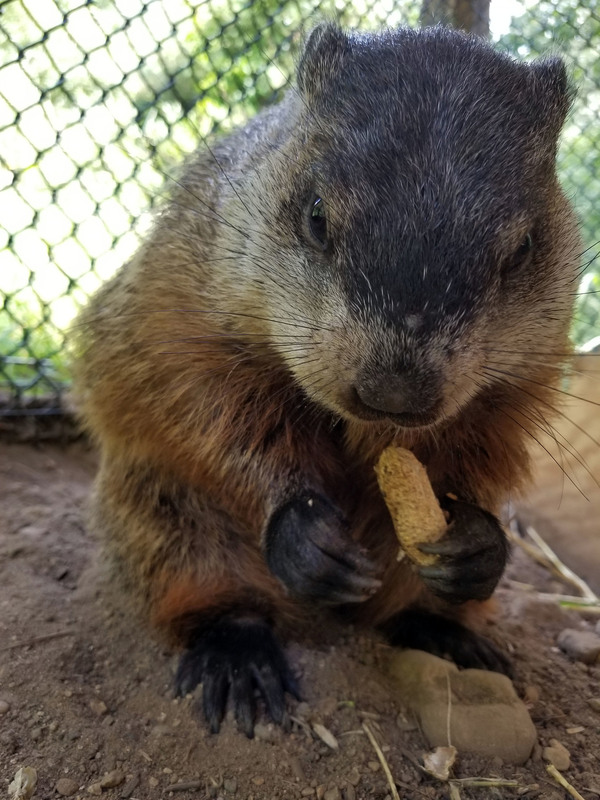 We think it is because, like the Easter Bunny and Santa Claus, prognosticating groundhogs live forever,” said Dana DeBenham, the nature center’s wildlife director. “She was rescued by a farmer’s wife after her husband had shot the mother and the young pup came crawling out of the burrow. No doubt the crowd shows up at the nature center for the free continental breakfast, the kids’ costume contest and the chance to be there in person among the many revelers waiting for Woody’s wisdom to foretell the future. Groundhog predictions don’t take long. Woody’s are usually completed within a couple of minutes. In 2017, Woody made a brief appearance in the arms of a DeBenham before retreating to her home, where she would stay. Having seen her shadow, the seemingly bothered groundhog retired to the warmth of her house. The year before that, Woody stayed indoors again while the crowd shouted down a timeclock to a deadline for the prediction. Six more weeks of winter again. “Her record is impressive! After a correct call last year of ‘six more weeks of winter,’ her record now stands at 15 correct predictions out of 19. This year will be her 20th prediction,” DeBenham said. “We do allow the groundhog to actually make the prediction by putting her in her ‘faux stump’ and giving her 30 seconds to emerge. DeBenham suggests Woody’s proficiency with prognostication may be linked to her gender. “We think Woody is exceptional at weather-forecasting because she is female and has that woman’s intuition about such things,” DeBenham said. The Groundhog Day event has become increasingly popular at the nature center over the years, with as many as 150 spectators in attendance. Watch videos of the Howell Nature Center’s prediction festivities from February 2017 and 2016. 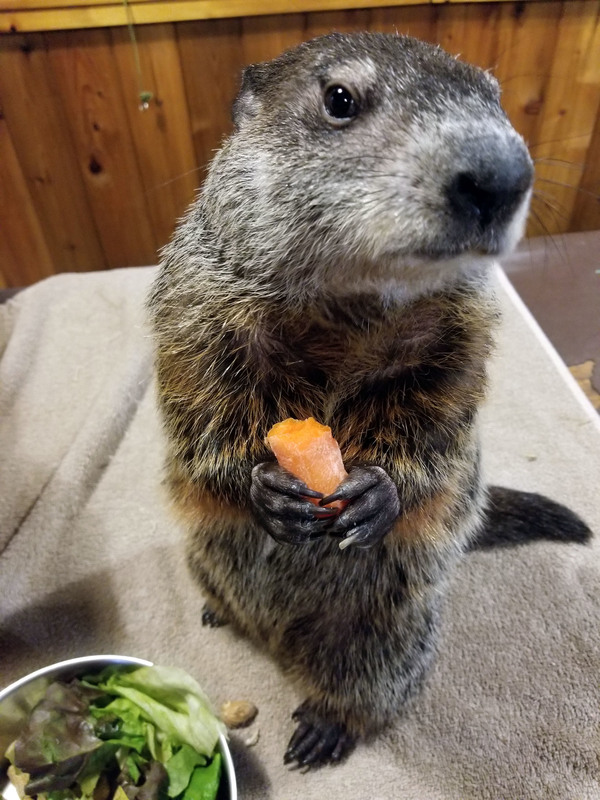 See more information on the 2018 Groundhog Day Celebration at the Howell Nature Center. EAST LANSING, Mich. ― Back by popular demand! The famous Japanese drummers, YAMATO, will return to Wharton Center’s Cobb Great Hall on Tuesday, February 6, 2018, at 7:30 p.m. Tickets are available at the official source to purchase Wharton Center tickets online, whartoncenter.com, at the Auto-Owners Insurance Ticket Office, or by calling 1-800-WHARTON. YAMATO’s acclaimed performances of Japanese Taiko drumming and music have captivated over 6 million people in 53 countries around the world. Celebrating its 25th Anniversary, the troupe continues to evolve and innovate, combining traditional Taiko drumming with modern athleticism and visual spectacle. YAMATO broke from Taiko’s long-standing patriarchy and has always included women in the troupe. And while the members train rigorously, beginning each day with a 10km run and weight training, Yamato imbues each performance with joy and a sense of fun, breaking from the stereotypical stoicism associated with this ancient art form. Icon Entertainment Group, the parent company for both the Johnny Cash Museum and Patsy Cline Museum, is busting with joy this holiday season with the acknowledgement that their “glossed” and “new” museums helped secure Nashville the #8 spot on National Geographic‘s “The Cool List 2018”. This spotlight came just a few days before Toronto, Canada couple Jackie and Tony Seccombe became the Johnny Cash Museum’s one millionth customers. National Geographic‘s “The Cool List 2018” highlights 18 destinations that the publication expects to “make it big” in 2018. Nashville was listed #8 on the list with the publication stating, “Like famous former resident Taylor Swift, Nashville has glossed itself up in recent years, with new museums devoted to Patsy Cline and Johnny Cash…” To read the full piece, click here. At 1:55 PM CT on Tuesday, December 12 Jackie and Tony Seccombe of Toronto, Canada purchased the one millionth (and one million and one) ticket to the Johnny Cash Museum. The couple was presented with a gift bag full of more than $100 of Johnny Cash Museum merchandise and a pass that will guarantee them two adult admissions to the museum anytime they visit throughout 2018. In addition, the one millionth ticket and a photo of them is currently being framed and will be presented to the Seccombe’s. Icon Entertainment Group, the parent company for The Johnny Cash Museum, also owns and operates Nudie’s Honky Tonk and Skull’s Rainbow Room. It was recently announced that a Merle Haggard museum and restaurant will be among their award-winning offerings in the summer of 2018.